St Winifred’s was built on the Welbeck Estate in 1913-16 for the Duke of Portland, to the design of D McIntyre, Clerk of Works, approved by Louis Ambler, architect. 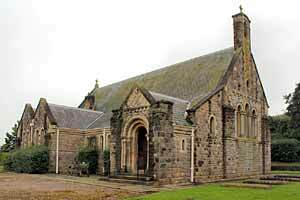 It replaced an iron chapel erected on the same site in 1889. It is a towerless neo-Norman stone building based on Steetley church. There is a nave, with round arches and columns, chancel, round apse, north aisle, north porch and a single bell turret on the west end. Many of the stained glass windows were designed by Herbert Hendrie (1887-1946), in the style of his work in the Liverpool Anglican Cathedral. The painting on the roof of the apse and north aisle was adapted from a 16th century ceiling at Cessnock Castle, Ayrshire. Symbolic features, such as the winged lion, are carved into the capitals of the chancel arch and north arcade. The font, possibly of early medieval date, was found near Mansfield Woodhouse. The pulpit is made of oak from Welbeck Park. The stone altar was made at Welbeck by Harry Stubbings. Two carved chairs in the sanctuary were made from the ancient Greendale Oak. The misericord in the Chaplain’s stall is by Lady Victoria Wemyss. There is a tablet to Major Lord William Augustus Cavendish Bentinck (d1902) by Eric Gill, who also designed the tombstone for Lady Ottoline Morel (d1938). for research on this entry and to Geoff Buxton and Dr Chris Brooke for the photographs.